Refer a friend. Get free stuff. Receive rewards for your canine companion for each friend who signs-up! The more people you refer, the more rewards you receive. Let us know if you need any promotional material and who knows you might never have to pay for Day Care again. How to Never Pay for Day Care or Baths Again. 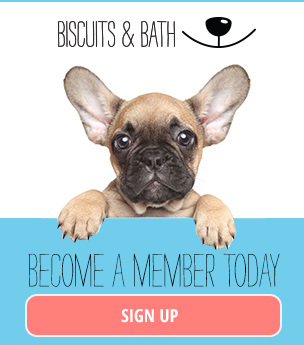 There are three ways to earn rewards when you successfully refer a friend to Biscuits & Bath. For each friend who sets up an account, you get: 1 Free Bath & Brush Out or 2 Free Days of Day Care. For each friend who purchases a Silver or Gold Membership, you get: 4 Free Bath & Brush Outs or 10 Free Days of Day Care. For each friend who purchases a Monthly Package, you get: 1 Free Monthly Package. Take some of our customer and pet profiles in hard copy form and write on the top of the form "Referred by Your Name"
Distribute customer and pet profiles to your friends, your friends' friends, and dog-friendly acquaintances at the dog run – be creative!